This book was edited and published by myself. However, as this is a comercialy produced book, with copyrights on it, and that some parts of the book were written by other people, (and partly due to the size of the book), it has not been included on this website. All that you will see here is the front and back page. 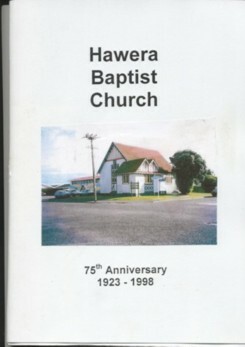 The book was written for the Hawera Baptist Church 75th Anniversary in 1998, but was not actually finished and published until the beginning of 2001. This is a 72 page book, with a number of black and white photos. 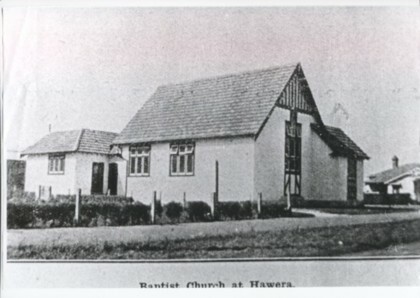 However, as I received a number of scanned images in colour, some of which were used in the book, this will explain why the front cover of the book seen below has a colour picture. If you are still interested in a copy, let me know. I am thinking of scanning all the pages from my copy, and putting them onto CD and making copies available that way. This would be similar to what Archives Books do (their website is http://www.archivecdbooks.org/). Should anyone request this, let me know. Details, such as price etc for this have not been worked out, and won't be unless someone does request a copy this way.